'Our students have worked hard to reach this level of competition,' said MHS Law, Public Safety & Security teacher and mock trial coach David Curry. 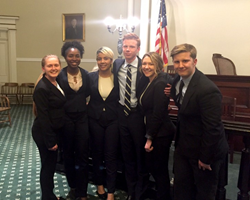 Milton Hershey School’s® Mock Trial Team has earned its first Regional Championship and advanced to the State Finals in the Statewide Mock Trial Competition, sponsored by the Pennsylvania Bar Association Young Lawyers Division. The team earned its Regional Championship title after defeating York Catholic in the Region 6 Finals on March 14. Region 6 is comprised of teams from Adams, Cumberland, Dauphin, Franklin, Juniata, Lancaster, Lebanon, Perry and York counties. Based on their performances during the Regional Championship, junior Olivia Cabrera was named best advocate and sophomore Susanna Compare was named best witness, her second award of the season. It has been a historic season for Milton Hershey School’s Mock Trial Team, who, in addition to the Regional Championship, also made the school’s first-ever appearances and wins at the District Championship and Regional Semifinals. The team now advances to the State Finals which will be held at the Dauphin County Courthouse in Harrisburg on April 1 and 2. The top 14 teams in the state will compete. The championship weekend will begin Friday, April 1, with Round 1 at 3 p.m. and Round 2 at 6 p.m. The Semifinals will take place Saturday, April 2, at 8:30 a.m. followed by the State Championship at 11:30 a.m. This year’s state championship team will compete for the national title at the National High School Mock Trial Championship in Idaho on May 12-14. Now in its 33rd year, more than 350 teams from across the state compete in the competition. Each mock trial has a strong educational emphasis and provides a forum for students to learn about the law, the legal system and court procedures, as well as improve their basic skills such as listening, reasoning and thinking on their feet. The six-member student teams argue both sides of a case in a courtroom before a judge. Students take on the roles of attorneys, witnesses, plaintiffs and defendants, with lawyers and community leaders serving as jurors. These juries decide the winner in each trial based on the presentation of the case and the team’s ability to follow court rules. Members of the Mock Trial Team participate in the Law, Public Safety & Security pathway of the award-winning MHS Career and Technical Education program. The CTE program pushes students to explore career options and then accelerates their growth by giving them tailor-made instruction with the ability to work in their chosen career path. Students are able to choose from 11 different career pathways to better prepare them for future success. More information about MHS and its Career and Technical Education program can be found at mhskids.org.